Freehold, RM195,000. (Code 590). SOLD June 2003 ! 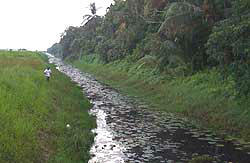 This is the view towards the subject property which is a neglected coconut plantation (right of photo). The property is separated from the sea by a reserve road (not tarred yet) and a river. Seen here is a sand/rock bund which is higher than the river and the subject property. Pontian Kecil is about 8 km to the north and Kukup is about 7 km to the south. Kukup is a traditional fishing village and is a very busy place during weekends where people come to enjoy sea food, take a trip to Kukup Island or to Indonesia. It is situated at the south-west tip of Peninsula Malaysia. If you like seaside, its a good place to built a retirement home. On closer look; this is the river separating the sea/sand bund and the subject property. We were not able to get close to the subject property as the undergrowth is a bit dense. There is a jetty here. 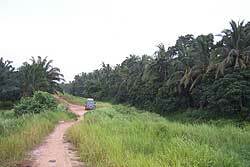 This is one of the laterite road leading towards the seaside. There are many other tar road leading towards the seaside. Only the last However the subject property is the 6th lot off this road. Until the seaside (reserve) road is built, one can only access the property using 4-wheel-drive vehicle.